The promising start with nice peat at nose get lost in tannic and over fermented taste in mouth followed by astringent and dry finish. Still some work to do to get on the right path. N: The peat [as it often does] has brought out the flavour quality of the barley, some ink (Serge), green olives, some odd crisp flavour – Hedgehog? Time brings an Ardbegian quality, albeit with soapy chocolate. T: Plastic-y Ardbeg with a funny ashy-briney-plastic developing. F: Peat brings the barley forth again, with ashy-lemony Earl Grey tea, waxy plastic and ashy milk of Magnesia to conclude. N: The peat makes a great attempt to iron out those strange porridgy-pongy edges. but the quirky family traits emerge soon enough. Time brings out more of the vanilla than either of the other two expressions. T: Good job again from the phenols, but they cant quite disguise that inherent spirity/soapiness and a citric sharpness. Serge: ‘ink’ – maybe a little squid ink for me. Things improve in the second half into the finish. F: The finish was the strongest part of both the ‘Original’ and the Pino Noir finish, and there is no exception here either. This has more on that chocolate and candied-banana, the peat: ashy>sooty>vegetal in character with a touch of long-gone creosote-treated fence panels alongside scorched chestnuts. Also, more veg stew [like the Pino on the N:] at the death – here more of a Ratatouille than a ragu base. touch of alluring decay notes. breathing thru the layer of oily white oak. F- Short-medium, eucalyptus coating, spicy heat, pickled ginger. Quite solid throughout and a good experimental peated version. You see this more often than not: distilleries that start to experiment with peated barley. 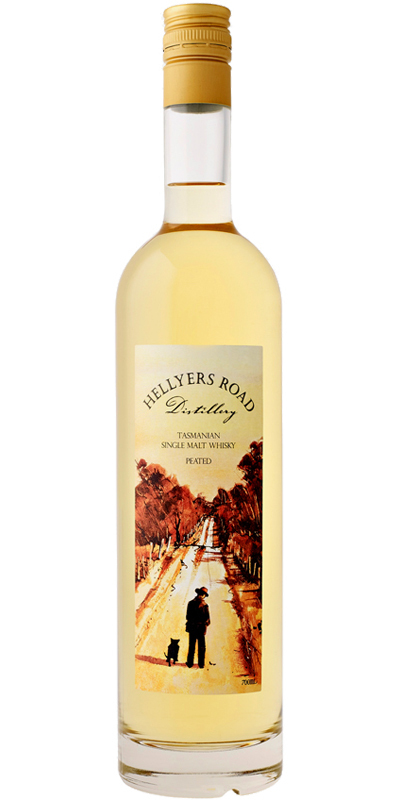 The Tasmanian Hellyers Road is no exception. They have both a Lightly Peated and this 9 Year Old Peated on the market. I wonder if this young Australian, produced from local barley, is up to the peaty task. Bham! A weird nose to say the least. Very peaty, but in a very different way than what you get from an Islay whisky. Not smoke but soot! Also diesel and even some white spirit (I mean the stuff you use to clean paint brushes, mind you!). The grass quickly evolves towards camphor and ferns, while there is not a trace of fruit, bar a light hint of nuts. And yet I like this. A lot. While the body is not creamy, it is mouth coating. Oily, let us say. But immediately very nice on smoked fish with lime juice, coriander and pepper. But also a hint of licquorice and a big oakiness, making it a tad bitter. Fruity? Not really. Some white fruit in the background, but it is the peat that makes this whisky. I am reminded of Caol Ila, which is always a good thing in my book. The finish is fairly long with quite a bit of woodspice and a mild deverlopment of smoke. This is my favorite Hellyers Road expression so far. That has everything to do with the peat, not so much the spirit, which is a bit sad. But that is just the way it is. Smooth peat with hint of coconut and citrus, long aftertaste. I find it really nice.